Just thought i would like to rant a little. started to have a problem with my broadband on the 15th June 2010, very slow download speed, did have 4.5mbs even though i was on the 20mbs home max, i knew i would not get more than 4.5mbs as that is all the line can take where i live, but this was ok. Anyway since the 15th the speed dropped down to 0.84kbs and has been the same eversince. i contacted the helpdesk (bad move), only to be told that it may be the filter, or a line fault (let them read through the script),and then was told they would send me a new filter. (already had a box full of them, all working). changed the filter for the new one when it arrived, new network cable, tested again with the desktop and my laptop on the master BT socket, still the same problem, removed the face plate from the socket and plugged into the test socket, still the same. phoned the helpdesk again, and was told it was a line fault. did a test myself ring 17070 option 2 for a quiet line test, no noise, hissing, squeaks, nothing at all. passed to the home phone helpdesk, they did a line test, low and behold, nothing wrong, then i was told to buy and I-Plate, when i asked what this was they did not know!!!!!!!! (it's supposed to reduce noise on the line) found this out myself online. just thought i would ring the helpdesk again, and was told they could arrange for an engineer to call out and test the outside line at the exchange, but if no fault found there they could come to my house and check but this would cost a call out fee of £105.00 + any repair. You can guess what i said to that. Anyone got any idea's as i am going off the wall now. forgot to mention that i did a livbox reset and all the other things they normally ask you to do. I still think this is a problem at the exchange side (maybe the line needs boosting)? Any help would be great, just need to get this resolved as i am getting nowhere with the Helpdesk side of things. Thanks all, (first time on a forum) pleased i found it. This is very typical of the 20meg service. The problem is a thing called DLM (Dynamic Line Management). It continually tests the line & adjusts the speeds accordingly. Unfortunately it's not the most brilliant piece of software around and can stick you at a low speed of 1meg for some time before starting to ramp it up. For me this process lasted 1 month before I was progressively increased to my current 14.5meg. The increase is done by putting you on a different profile and currently you're on the 1meg profile. It'll then go to 2meg then 4meg etc. Other members here have not suffered too well with this process and the progression to true speeds has been seriously drawn out. There's little point calling the "help" desk as they are totally useless & you just waste time & money. Leave the router on 24/7 and be patient. You could show us the router stats though. I rang the helpdesk as i received an e-mail from them this morning saying that my broadband account had been closed due to payment issue????? They did not know what they were talking about, women on the other end told me there was no outstanding payment issue's and my account was fine and up to date, ( were they just trying to wriggle out of my constant complaing)??? Anyway phoned the broadband helpdesk again, they raised another line fault and will be testing and boosting the line over the next few days. Why? could they not do this in the first instance when i first complained on the 15th. Seems a lot of people have the same problem when switching to the 20mbs service, total loss of speed, and hours on the phone to ask what is going on. Don't know what you needed to see as far a stats go. any info on what this means would be great, i ain't got a clue, i just use broadband now provide it. The DLM controls your speed by adjusting the Noise Margin. Yours is currently at 26.4dB and eventually will be dropped to approx 10dB giving you a speed of close to 4meg. There's not much that you can do other than be patient and let the DLM do it's job. 0range have been known to set a manual profile but that's not been overly successful. Leave the router on 24/7 and don't reboot it, the DLM will effectively do that when it needs to. I joined 0range as it was the only ISP who could give me good speeds and their price was good. The first month was grim with slow speeds and appalling support but once I got thru that I've been more than happy with the service - as long as I don't need to contact support that is. Don't waste your time calling India but if things don't start to improve in the next 2-3 weeks then email the top man at the executive office (tom.alexander@orange-ftgroup.com ) & state what's happened. I found this to be quite useful. Attenuation (dB) : 52.5 - the factor that limits your max speed - it's like resistance where lower is better. Attainable download rate (kbps) : 3771 - the max speed you can expect with your attenuation. Rate (kbps) 1019 604 - Current speeds. But with an attenuation of 52.5dB you should not be on ADSL2+ as it just will not perform effectively on that length of line. 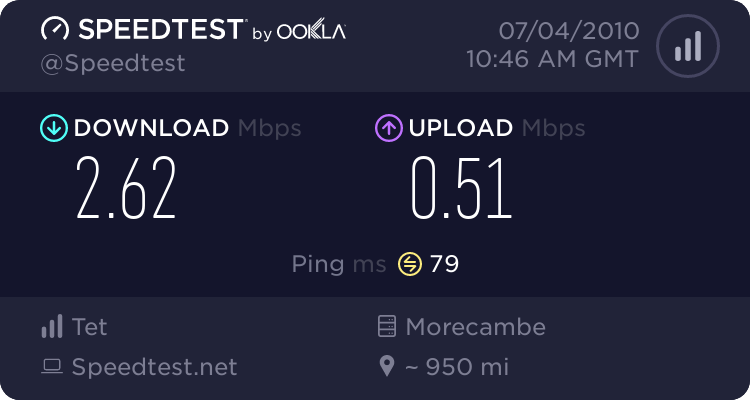 forgot to mention that i have been on the 20mb service for just over 7 months, and this problem with the lack of download speed only started on the 15/6/2010, everything was fine up until then, i had no problems with disconnection, or slow speed before then. i received a I-Plate and fitted it this morning, would this show any increase in speed straight away, or would this take a few days as they are still doing a line test? sorry i don' understand the bit about the Attenuation (db): 52:5, is this to do with noise on the line?, or does this figure determine download speed that the line can handle? sorry to be a pain, lost with all of this. Attenuation basically indicates the length of cabling between your router and the local exchange in digital terms rather than Kms/miles. The best ADSL2+ (G.992.5 Annex A) connection speed you can expect is around 4500kbps. Whereas if you had ADSL1 (G.992.1 Annex A) you would probably get nearer 5500kbps. The reason being that ADSL2+ uses higher frequencies which, when you're far from the exchange, never reach your router. But ADSL1 uses the lower frequencies which do reach you. Still waiting for a rely from Orange themselves, ain't ringing the heldesk again, on for ages, and costing me a small fortune. Hi. 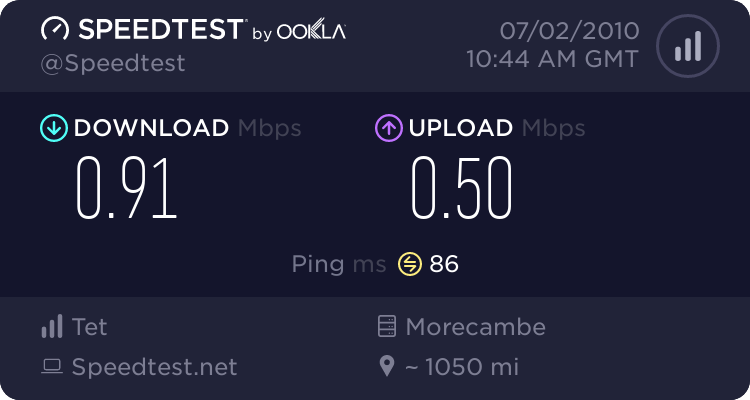 i sent off an e-mail to (tom.alexander@orange-ftgroup.com) see if that will help, sent figures of speeds before and after, and all mails received from the broadband helpdesk. Received a call fro Orange this morning, saying that the line test still in progress and to wait up to 10 days!!!! Did another speed test today and a slight drop in speed fro yesterday. Will let you all know what happens. Query, do you know if you went through a recent migration to LLU? The DLM system exists on both IPStream and LLU. The up to 20 meg packages are available for both areas also but limited to 8meg (8192) on IPStream Max. You can usually tell by the price you pay as well as IPStream customers generally pay more unless they are on an older package from years ago. ...saying that the line test still in progress and to wait up to 10 days!!!! DLM timescale for the line to adjust, similar to a new provision only without the termination of the signal. Well, i received a text from Orange to call the helpdesk as there was an update about my broadband. I did try to phone twice, but both times i was kept on hold in a queue for over half an hour at national rate, the first time i hung up, second time i was cut off just as i got through to the advisor, so i e-mailed them instead. I will check again tomorrow and see if it is faster again and let you know. You should only pay for the call once someone answers, automated response does not count as a call being answered, or at least shouldn't.